Ambulatory Heart rate monitoring (electrocardiogram [ECG]) records the electrical activity of your heart while you do your usual activities. Ambulatory monitors are referred to by several names, including ambulatory electrocardiogram (ECG), Holter monitoring, 24-hour ECG, or cardiac event monitoring. The period of monitoring, is typically 24 hours can be for much longer. Many heart problems become noticeable only during activity, such as exercise, eating, stress, or even sleeping. A continuous 24-hour recording is more likely to detect any abnormal heartbeats that occur during these activities. Many people have irregular heartbeats (arrhythmias) from time to time. The importance of irregular heartbeats depends on the type of pattern they produce, how often they occur, how long they last, and whether they occur at the same time you have symptoms. Because arrhythmias can occur off and on, it may be difficult to record an arrhythmia while you are in the doctor's office. Ambulatory monitors may be continuous as above or intermittent, which is used when symptoms of an abnormal heart rhythm do not occur very often. An intermittent recorder can be used for a longer time than a continuous recorder and include external loop recorders or internal loop recorders. Internal loop recorders are small metallic devices , the size of small cigarette lighter, which are inseerted under the skin using local anaesthetic and can record the activity of the heart over many months. This test allows for the recording of blood pressure throughout normal activities and during sleep. It can help to differentiate genuine hypertension (high blood pressure) from white coat hypertension (increased blood pressure in the presence of health professionals only). This is an indirect and non invasive test used to assess the stiffness (hardening) of the major arteries. Increasing arterial stiffness and associated reducing elasticity occurs with age and in association with a number of cardiac risk factors. It is an increasing robust and useful heart risk or heart screening assessment tool. 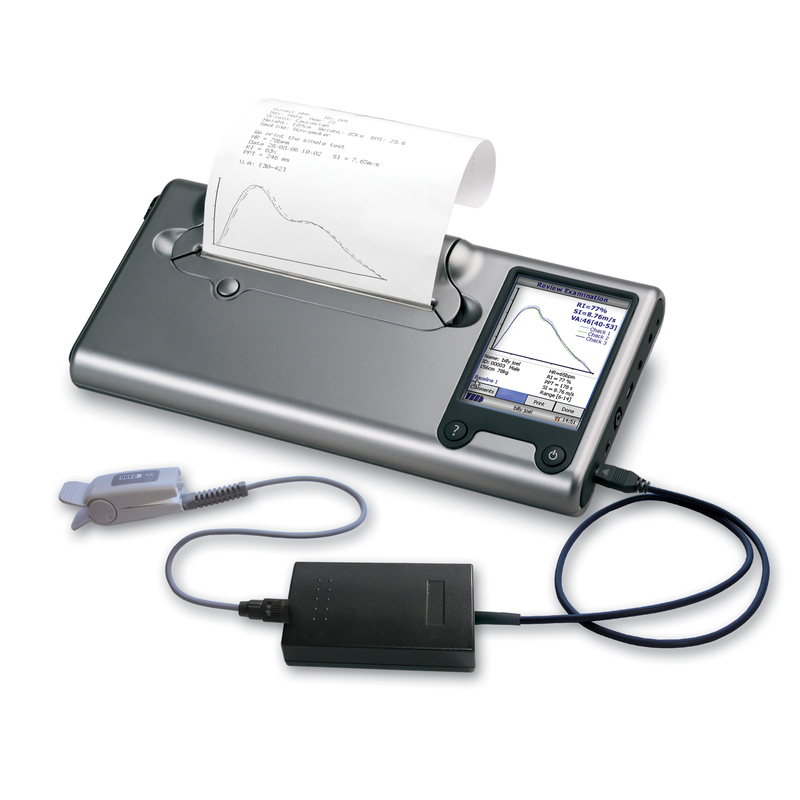 At Heart Clinic Poole the Pulse Trace PCA2 device (below) is used. The test takes less than 2 minutes to perform and involves attaching a transducer to a finger tip. The technology uses the priciple of pulse contour analysis to measure the spead of the forward and reflected pulse waves with an immediate result available. This test provides highly detailed pictures of the heart and blood vessels and can distinguish tissues from moving blood. It can differentiate between heart muscle and surrounding tissues MRI excels at showing the heart from multiple imaging planes. This test typically takes at least half an hour and there is no radiation involved. It has many potential disadvantages and advantages over other cardiac imaging tests such as echocardiography. This is a minimally invasive assessment of the heart, lungs and circulatory response to exercise either on a bicycle or upright treadmill. It is the most robust assessment of cardiopulmonary fitness. Unlike most stress tests CPX is unique in that it assesses the heart, lungs and circulation in one test. It involves attaching a facemask and ECG electrodes during rest, exercise and recovery. It involves assessing the patients' consumption of oxygen, continuous ECG monitoring, cardiac output, assessment of oxygen saturation, carbon dioxide production among a huge number of other measured variables. A typical test takes about 40 minutes to complete in total. At the Heart Clinic Poole we have acquired a state of the art system with fully integrative diagnostic and interpretative software and are one of only a few centres offering this service along the UK south coast. This is heart test used to indirectly evaluate the arterial blood flow to (and indirectly the amount of oxygen that will reach) the myocardium (heart muscle) during physical exercise or following an administered stress agent, compared to blood flow while at rest. The results can also reflect overall physical fitness. These tests do not assess emotional stress, or other connotations of the term stress. Stress test abnormalities (i.e. if it is "positive") are an indication of marked imbalances of relative blood flow to different portions of the Left Ventricular muscle tissue of the heart. This is important because the Left Ventricle of the heart performs the greatest amount of work involved in pumping blood around the body. Blood flow imbalances within the heart muscle of the other three heart chambers are not detected this way. This is a minimally invasive procedure to access the coronary circulation and blood filled chambers of the heart using a catheter. It is a day case procedure and is performed for both diagnostic and interventional (treatment) purposes (PCI). Coronary catheterization is one of the several heart diagnostic tests. It generally takes about half an hour and access to the coronary circulation is gain either via the right femoral artery (in the groin) or right radial artery (wrist) under local anaesthetic. The procedure is performed in order to identify the presence of narrowing or occlusion in the coronary arteries which supply the heart with its own blood supply. It is also performed as part of work up for major cardiac surgery such as valve surgery. The risk of a major complication from the procedure is generally less than 0.3%. This is a non invasive method of coronary angiography which involves injecting contrast into the veins (vessels which return blood to the heart) rather than arteries (pulsatile vessels that transfer blood from the heart). The heart is imaged using computerized tomography and involves lying inside of a cylindrical tube. It is an emerging area of non invasive cardiac imaging, but does have several potential advantages and disadvantages compared with classic coronary angiography. This is a non invasive test to image the function and motion of the heart using ultrasound, in manner similar to that used to image the baby in pregnant women. This is a non invasive test which provides a point in time assessment of the electrical activity of the heart. 10 electrodes are attached to the patients and the test takes less than 5 minutes, from which 12 snap shot electrical images (leads) are obtained. The ECG does not directly assess the contractility of the heart, as provided by echocardiography. However, it can provide information of the patients' heart rhythm, rate and an indirect assessment of whether there has been any damage to the heart. This is a form of cardiac stress testing which involves exercising whilst ECG electrodes are attached to the chest. It involves walking faster and up an increasing incline to work the heart and see its electrical responses as well as the effects of heart rate, blood pressure and symptoms. A typical test takes less than 15 minutes. The data acquired may provide indirect evidence of the presence of coronary artery disease but the test may be performed for a number of other reasons including the assessment of physical fitness (see cardiopulmonary exercise test). This test involves imaging the heart using the distribution properties of radiopharmaceutical imaging agents with the images being obtained by a scintillation camera. The images of the heart at rest and following stress ('physical not emotional stress' with medication or via exercise) are compared and can be used to make an indirect assessment of coronary artery disease. A stress echocardiogram is a minimally invasive test which allows your Doctor to look at your heart using echo ultrasound and ECG recordings at rest and also during stress when it is beating faster. The stress can be created physiologically with exercise or via pharmacological agents such as dobutamine. The test will help your Doctor to assess the response of the heart to stress and detect any effects of coronary or valve disease on the pumping action of the heart. This test records moving images of the heart using ultrasound. It typically takes about 20 minutes to perform. It involves the application of jelly to the end of a small probe that is applied to the chest wall to acquire the heart images. This is an extremely low risk procedure. This test records moving images of the heart using ultrasound. However, unlike tranthoracic echocardiography this test whilst still minimally invasive, involves application of a topical anaesthetic to the back of the throat and administration of a short acting mild sedative a small probe, no larger than the size of the middle finger, is passed down the throat in order to acquire highly detailed heart images. Patients can go home as soon as two hours post procedure.